also it located in an isolated jungle. It got the name after the US aviator, Jimmy Angel fly over the falls in a plane for the first time. 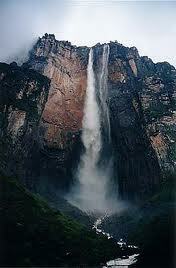 It falls from the top of Auyantepui mountain in the Canaima National Park, the sixth biggest national park in the world. The height of the falls was determined by an American journalist Ruth Robertson in the year 1949. The first climb successfully done on January 13, 1971. It takes around 10 days for the climbers to reach top and around 2 days to come down.